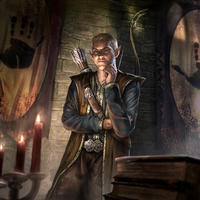 Ungolim was a Bosmer member of the Dark Brotherhood who had ascended to the position of Listener of the Black Hand by 3E 433. Ungolim maintained a private residence in the Cyrodillic city of Bravil, and visited the Night Mother's statue on a daily basis, receiving the "Whispers of Death" from the Unholy Matron, and conveying her will to the Speakers of the Black Hand. He was assassinated in 3E 433. Ungolim as he appears in Oblivion. For game-specific information, see the Oblivion and Legends articles. This page was last modified on 4 February 2018, at 11:54.